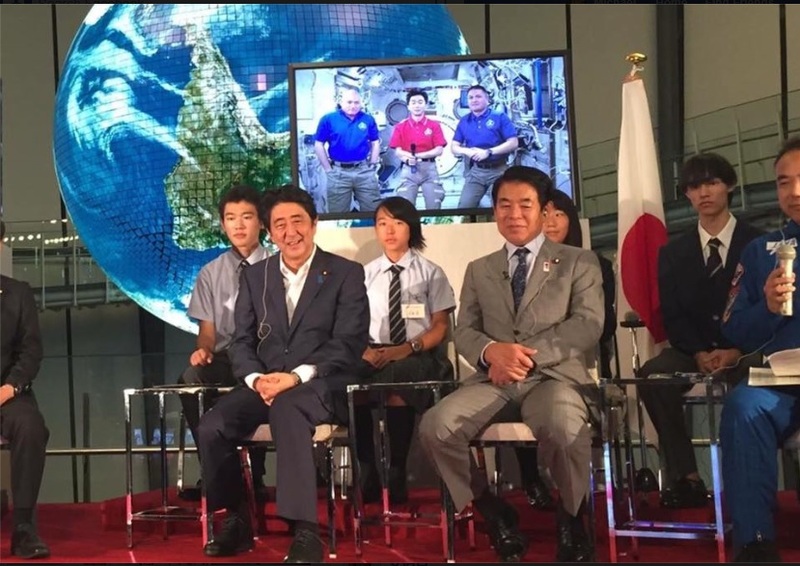 "Yui-san, I see you are flanked by two U.S. astronauts. This would be a perfect time for you to express your indignation at Russian Prime Minister Dmitry Medvedev's recent visit to Etorofu!" "Abe has weathered a hot summer, both inside and outside the Diet building," said Michael Cucek, an adjunct professor at Sophia University in Tokyo. "It seemed for Abe the news could not get any worse, and then it happened: the news did not get any worse,” he said, adding that Abe seems to be "levitating in contempt of the normal downward pull of political gravity." The crucial relationship is between the words "seems" and "to be levitating." Abe is not actually levitating. He does not have to: he is standing atop a lit multi-stage rocket. There are likely more stages below these, hidden in the clouds. 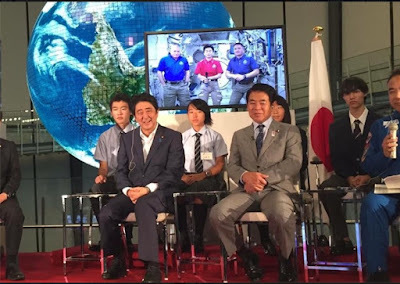 Original image courtesy: Abe Shinzo Facebook page. So, at this rate Japan has 3+ more years of 'leadership' which will take it further and further away from resolving its demographic/economic challenges. And 3+ more years of increasing alienation from its two main neighbors of China and S Korea. * The demographic and economic challenges are being met by women entering the workforce, the pattern for the last 25 years. At some point, and if you look at the labor force participation rate charts you know it will be relatively soon, the well of surplus labor will run dry, forcing a reallocation of resources. It is going to be done through increased wages rather than government policy. 3) it will march right through any facetious or vain attempts for politicians to hold back change. ** Abe is prime minister for the next 3 years if he wants to be, or if his body lets him. 4) Alienation from China and the ROK depend upon the goals and attitudes of the leaders of those two nations. It is not dependent upon Abe. Prior to becoming PM again Abe talked a lot about leading radical change. In three years as LDP president and 2 1/2 years as PM he has found that a PM and his staff can work like hell,day in and day out, and get almost nothing accomplished. Unless he is absolutely dim he has come to realize he has three years ahead of him to get an equal amount of nothing accomplished.